Dads. Fathers. What makes a dad? Who can be a father? Is a dad a person or something more? A role to fill? In order to be a father figure, what figure must a father take? What is a dad’s shape? Don’t ask this Natty Daddy, because it wouldn’t know an EFFING THING ABOUT ANY OF THAT. It never comes to any of your soccer games: I walked into the market like any normal, legal adult who wished to purchase a pre-Cam’ron beverage might. As usual, I had 40s on my mind, but given the lateness of the hour I doubted my ability to slurp one down as fast as the night required. A tall can of fruity punch for grown-ups would do quite nicely, I thought. That was all I wanted. 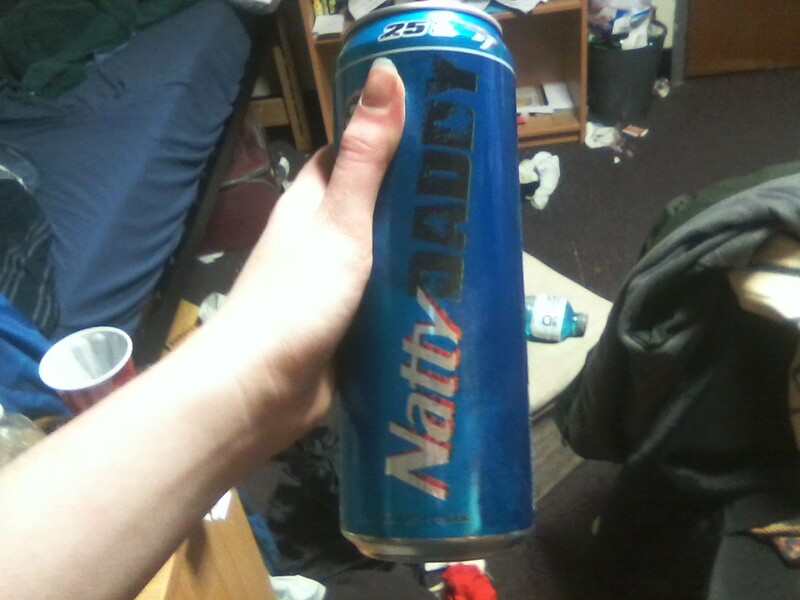 But then I looked up and saw the Natty Daddy; this was my first mistake. It never remembers to walk the dog: If you see the Natty Daddy, look away as fast as you can and you might escape. By that point, of course, it was too late for me. This Natty Daddy was my new dad now, and there was nothing I could do about it. I removed it from the shelf, its cold, aluminum surface slick in my hand. I shivered. It can’t grill a burger to save its life: Loathing and panic fought for dominance in my chest. I looked around for help but no one would meet my eyes. They knew there was nothing they could do to change my fate. It was written years ago, when the atoms that would form this aluminum can self-destructed their host star, choosing the horrific pain of a supernova and a billion years of frozen purgatory for a single purpose. Even then, they knew my name. Even then, they were my new dad. It won’t insist on giving any of your friends a firm handshake: As I shuffled slowly through the aisles, I could feel my self slipping away, along with everything I had ever known or dreamed. It hurt less than you would think, but more than any suffering I had ever endured. Its golf game is atrocious: The Natty Daddy destroyed and ruined all that I held dear, but none of that matters now. Looking over the bleak waste of what was once my life, it told me that it was proud of me. I love my new dad.